Severe pressures on the agricultural resources base interacting with increasingly intensive climate change suggest there may be a need for larger-scale systematic and transformative changes. The paper presents four case studies to highlight different ways to explore adaptation options ranging from incremental capacity approaches over short time horizons to transformation impact approaches for longer time frames. They suggest a range of ways in which we can make transformative change, such as shift in diets, food supply chains, sites of agricultural production, system of land allocation, and incentives for linking land and water use to ecosystem service functions. 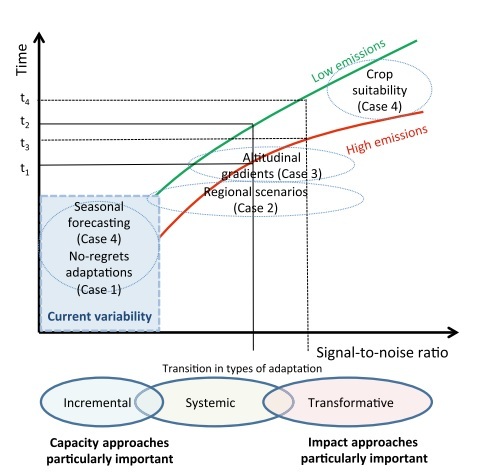 Schematic framework of the relationship between signal-to-noise ratio for a climate impact and the period during which progressive levels of adaptation occur. The relationship varies according to greenhouse gas emissions. The shaded box shows current climate variability, where the signal-to-noise ratio is less than 1. We present a framework for prioritizing adaptation approaches at a range of timeframes. The framework is illustrated by four case studies from developing countries, each with associated characterization of uncertainty. Two cases on near-term adaptation planning in Sri Lanka and on stakeholder scenario exercises in East Africa show how the relative utility of capacity vs. impact approaches to adaptation planning differ with level of uncertainty and associated lead time. An additional two cases demonstrate that it is possible to identify uncertainties that are relevant to decision making in specific timeframes and circumstances. The case on coffee in Latin America identifies altitudinal thresholds at which incremental vs. transformative adaptation pathways are robust options. The final case uses three crop–climate simulation studies to demonstrate how uncertainty can be characterized at different time horizons to discriminate where robust adaptation options are possible. We find that impact approaches, which use predictive models, are increasingly useful over longer lead times and at higher levels of greenhouse gas emissions. We also find that extreme events are important in determining predictability across a broad range of timescales. The results demonstrate the potential for robust knowledge and actions in the face of uncertainty.